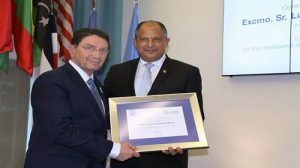 San Jose (Costa Rica) – May 11, 2017 (travelindex.com) – As part of the observance of the International Year of Sustainable Tourism for Development, the World Tourism Organization (UNWTO), which is leading the campaign, has named Costa Rican President Luis Guillermo Solís Rivera as Special Ambassador of this important global action. The initiatives developed by Costa Rica in the field of sustainable tourism as well as its international positioning and momentum in this field are some of the factors behind the designation. Traditionally considered an example of environmental commitment, Costa Rica is home to 5% of the world’s biodiversity. In addition, more than 25% of the country’s land area is classified as protected, and the country is already being powered 100% with renewable energy. One of the most outstanding initiatives carried out by Costa Rica has been the creation of the Certification for Tourism Sustainability. The programme, designed by the Costa Rican Tourism Institute, categorizes and differentiates tourism companies based on their environmental commitment. “This recognition for Costa Rica bears witness to our emphasis on this non-smokestack industry. It also allows us to strengthen our drive to encourage more women to lead sustainable tourism projects for their economic empowerment,” said Luis Guillermo Solís Rivera, President of the Republic of Costa Rica. “The International Year of Sustainable Tourism for Development is a unique opportunity to promote common action, but also to underline efforts in this field; and Costa Rica’s contribution to global sustainability is one of the best examples to follow. We are very grateful to President Solís for his support and leadership in advancing tourism as a tool for sustainable development,” explained UNWTO Secretary-General Taleb Rifai. The International Year of Sustainable Tourism for Development marks an important milestone in the 2030 Agenda and in the progress towards the achievement of the Sustainable Development Goals, in which the tourism sector appears as a key tool. The figure of Special Ambassadors is aimed at providing a global focus to the International Year, as well as to highlight the commitment of leaders and prominent personalities in the development of sustainable practices in the tourism sector.